A Ulloa is an interior region of the province of Lugo known deservedly for a unique gastronomic product: cheese. In this territory (and the bordering municipalities of A Coruña), of soft hills, covered in old chestnut forests and crossed by streams of pristine water, roam the hundreds of cows that produce the milk necessary to elaborate the products of the Arzúa-Ulla Protected Designation of Origin. We propose a route by the main river that can serve as an excuse to visit the area. This is the Torrentes de Mácara route, and the best way to get to the start is to do it from Palas de Rei, taking the road to Pambre. A couple of kilometres past this town and its beautiful castle, a track on the right indicates the beginning of the walk. In fact, some people prefer to start from the castle itself, a spectacular fortress of the fourteenth century that inspired the writer and religious Antonio López Ferreiro to write one of the fundamental books of Galician literature. In any case, the route of the Mácara torrents begins properly in a spectacular chestnut forest that you must cross to then, turning left, reach the river, which is none other than the Ulla. 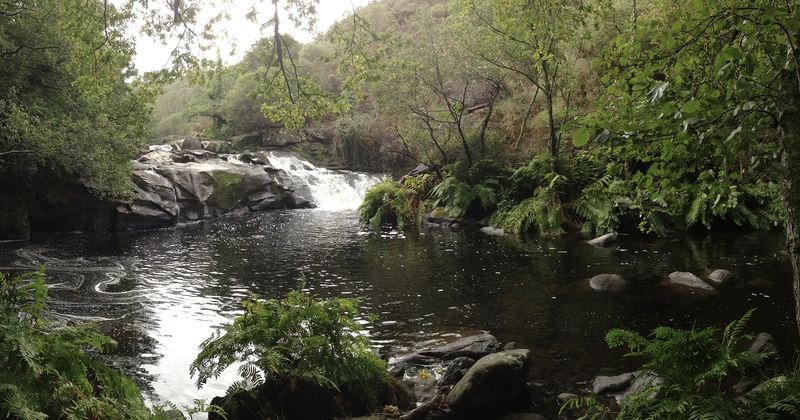 The third largest river in Galicia has a much smaller size here than it will reach as it approaches the Arousa estuary, where it dies, but usually has great strength. In fact, during the journey you will find a series of pools that invite bathing, but you must be very careful, because water can play some tricks here. The route is suitable for hikers with some training. Along the route you will find more than one obstacle (stones, logs, slippery sections) that should be overcome using even your hands, and that can get those less experienced in some trouble. The path allows you to make stops every so often in areas where the water rests before resuming its path with speed and, sometimes, with certain violence. The “torrents” form small waterfalls or some rapids every few meters, a beautiful sight to watch and photograph. The current is surrounded by a thick riverside vegetation: among oaks and chestnuts, helped by the humidity, ash and hazel trees abund. If, in addition, you walk the route in autumn, the variety of mushrooms that grow by the river will surprise you. But watch out! It is convenient to be an expert to eat or even manipulate them. Although in the Galician mountain many edible fungi are produced, there are also some poisonous mushrooms that can give you quite the scare. If you want to end the route’s experience in the best possible way, it is highly recommended to get to Palas de Rei afterward. The town, one of the most important of the French Way to Santiago, has numerous establishments in which to buy and taste the local cheese. Arzúa-Ulloa is one of the best known varieties of Galicia. It is made with cow’s milk and its smoothness and acidity make it ideal to accompany quince jam.